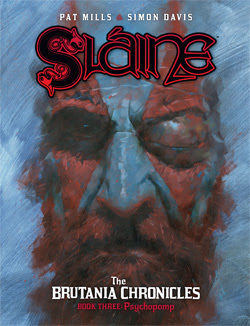 The latest collection of Sláine is available this week! Revenge of the Cyth! Albion, in a time of legend. Celtic warrior Sláine united the tribes of the Earth Goddess Danu and became the first High King of Ireland, before returning to being a wanderer. Now, having journeyed to the Isle of Monadh to rescue Sinead from the Drune Lords, he’s discovered that they have been experimenting on their own creations, including the brutal, superhuman Primordial, whom Sláine has just learnt is his old friend Gort. The fully-painted epic story of the UK’s bestselling Celtic barbarian continue!